SE STUDIOS - Getting Started Recording at SE Studios! Q: WHO DO WE WORK FOR? Our clients include famous Authors, Researchers, Filmmakers and even an occasional "Rising Star". The things they have in common are that (1) They know what they want (2) They never second guess themselves and (3) They are successful at recruiting people to join them in their mission, thus bringing about the vision that they have been given. If you are a Voice-over Artist or a Solo Music Artist, then we are very excited that you are interested in SE Studios as a potential place to record your next project. Q: DO WE MAKE DEALS FOR RECORDING TIME? A: Let me answer that by asking you a question... "If you were building a Time Machine. Would be be trying to strike up a deal with the guy for a "good price" or would you want something that you could count on to work when you need it to? 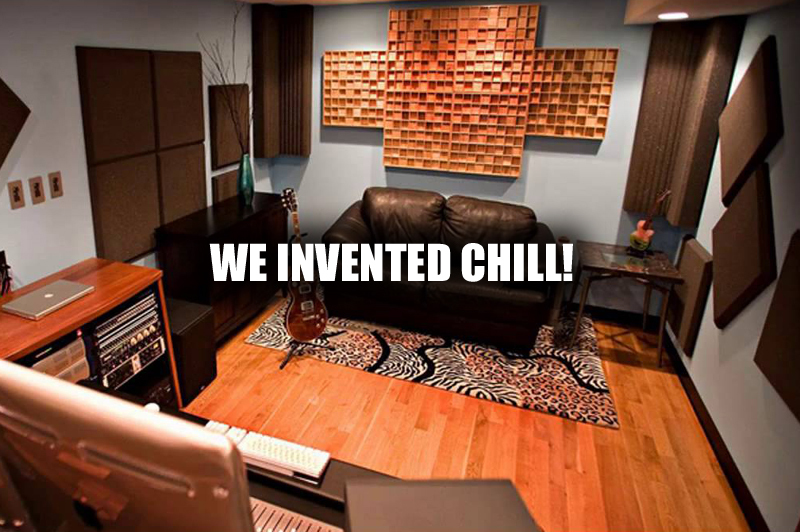 That describes our amazing team here at SE Studios and Progressive Edge Records! That being said, let me tell you about the countless people that I have personally recorded, who promised to pay me all this money and do all this stuff and nothing ever became of it. I have to set some boundaries when it comes to my time, because as a producer I am a very busy man. I do love helping people on their journey to being Recording Artists. Q: I HAVE A BAND AND WANT TO RECORD A CD? A: If you have a band that you would like to record, then you are still welcome to use our free resources, but when you are ready to start, then please call Bruce Wheelock at Flying Whale Recording and he will take really good care of you. Bruce recorded my first demo when I was 15-years old and he did an amazing job back then in 1980. Record your songs during live gigs and pre-production rehearsals. Even a simple single track recording may reveal weak parts of songs. Using a computer or sequencer? Prepare all sequenced material before the session. Take care of your body before and during your recording sessions. Eat well, get enough sleep, and keep your ears rested and clear. Be early! At some studios, the clock starts running whether you’re there or not. Find out about their cancellation policy as well. Make the studio a comfortable and relaxed place. If it’s not, it will show in your finished product. Make sure you and the engineer have the same vision – go over your songs with him/her before recording. Before booking your studio time, ask to hear other material the engineer recorded. Depending on whether your studio has 8, 16, 24, or 48 track capability, plan out how you will leave room for all of the essential parts. This should simplify the mix and eliminate the need for bouncing tracks later. 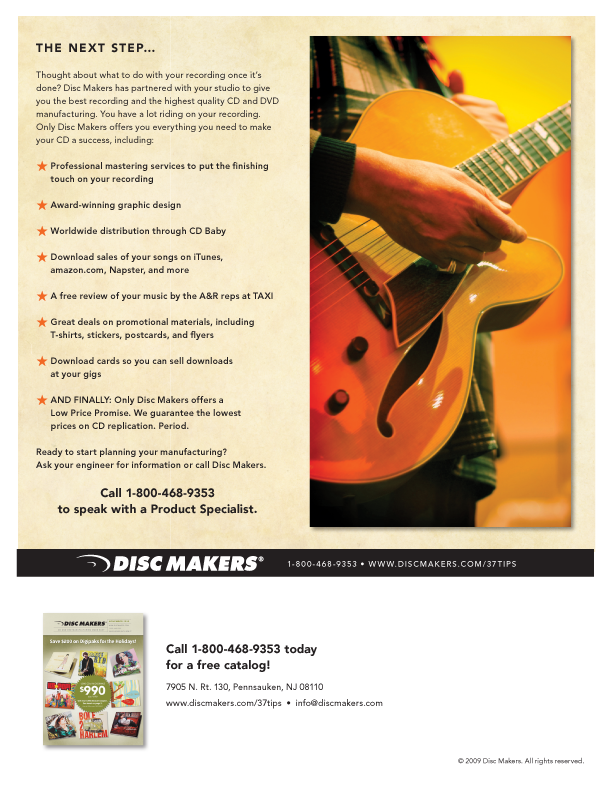 Use new strings, cords, drum sticks and heads – and bring spares! Don’t use new gear or different equipment that you haven’t used before, even if it’s “better than what you have.” Surprises can cause problems. Remember, it’s emotion and feeling that make the best song, not necessarily the best technical rendition. If you mess up a part while recording, don’t stop and start over. That can easily cause you to burn out. Instead, check to see if the engineer can punch in the correction. You don’t have to fill all the tracks on the tape – don’t try to force something that won’t fit. Always keep in mind the focus of your music. If it’s the vocals, plan to spend the most time on them. Don’t waste time on things that don’t highlight the focal point. Unless you have unique effects, record individual tracks clean and add effects later. Listen to your music at moderate levels in your car or on a boom box. This is how most of your fans will listen to it, and mixing at loud levels will fatigue your ears and distort the “true” sound. Sometimes it’s good to take a day off and come back to listen. The same applies for mixdown. Ears don’t last very long in the studio! As you review each mix, make sure you can comfortably hear all of the instruments. Tweak the mix on a small pair of speakers at an extremely low volume. Headphones are also very valuable at this stage, but don’t base your final decision on them. You should be able to pick up each instrument even at this level. Learn to recognize ear fatigue. You’re better off quitting a session early when you’re tired than wasting time making a bad mix that will have to be redone anyway. Listen in the studio to CDs you’re used to hearing on your home stereo to get an idea of how the studio’s system sounds. If mixing somewhere other than the recording studio, make sure you use the same speakers. If not, the mix will sound completely different. Once you have selected an engineer (or a producer) to mix your recording, have them do the first mix. Their ears are better trained than yours. Try to keep an open mind. Think about the songs as a whole and not just the individual instruments. Otherwise everyone will want their instrument louder in the mix. Determine a band spokesperson ahead of time. An engineer getting five different opinions on how to mix will grow tired and might cause him/her to rush through the job. Decide which format you want the finished mixes to be on: high resolution .wav or .aiff files on CD-R, DVD-R, or flash drive are the preferred format, however an audio CD or DAT are viable options as well. Budget for and count on unforseen delays.